Clear the Air by . . . Driving? At least by driving smarter. Hear us out: You’ve heard that a big chunk– roughly 50 percent — of Salt Lake City’s winter air pollution comes from motor vehicles. That’s why SLCgreen promotes cleaner transportation and getting out of our cars as much as possible, particularly during February and the Clear the Air Challenge. But, we know that taking public transit, biking, or purchasing an electric vehicle is not practical for everyone – yet! However, there are some important ways to reduce pollution even when you do drive. Avoid Cold Starts. Cold starts occur when we start our vehicles after they have been resting long enough for the engine to get cold. Did you know? A majority of the air pollutants used across an entire journey are emitted in the first few minutes after you start your car. A study from the Utah Department of Environmental Quality “found that 75 percent of combined pollutants and emissions are emitted from a car during the first three minutes after a cold start,” as described in a UCAIR’s blog post and video below. 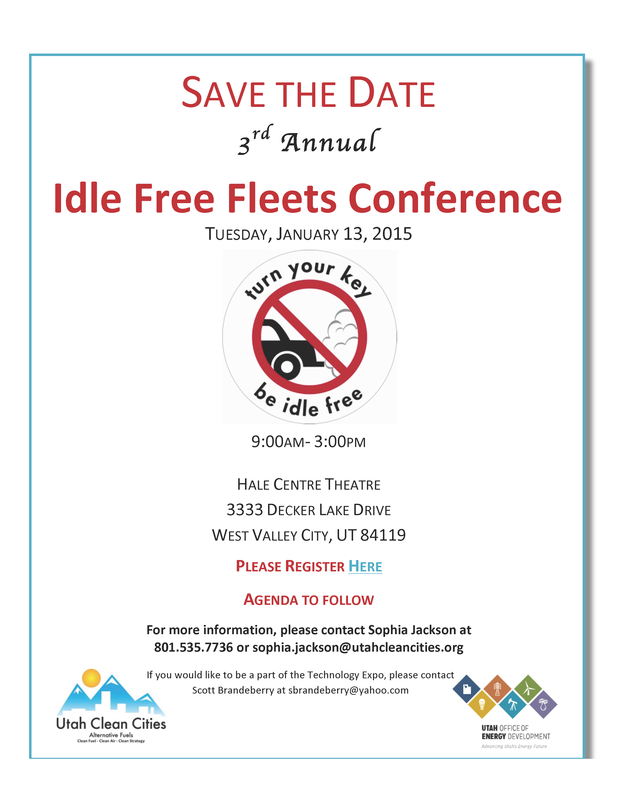 The Third Annual Utah Idle Free Fleets Conference will take place on Tuesday, January 13, 2015 from 9 a.m. to 3 p.m. at Hale Center Theatre. Questions? Contact Sophia Jackson at (801) 535-7736 or sophia.jackson@utahcleancities.org.